Last weekend, Constance went to a Christmas Party for Ross Bay Villa Society members, who contribute to this house’s restoration. The goal is to have it look as it did during the 1860’s, and to educate people about family life in Victoria at that time. 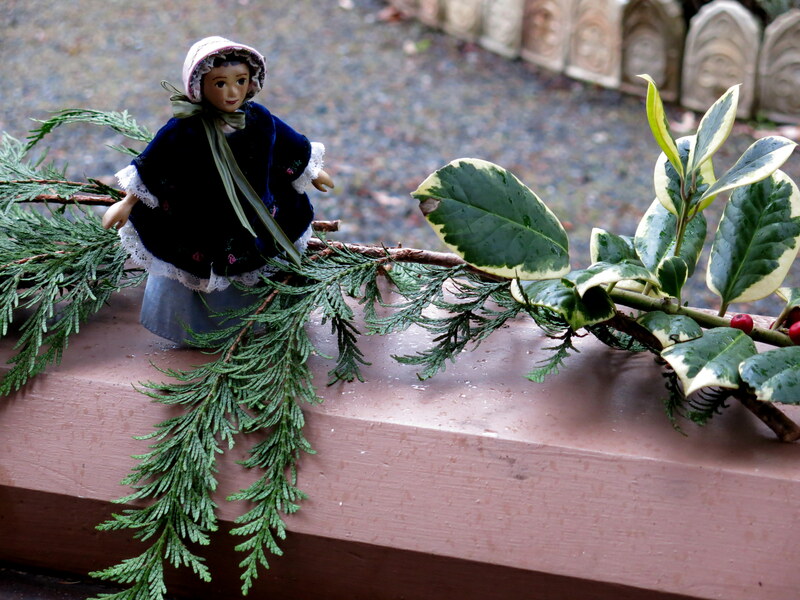 It was a wet and windy afternoon – but the house was decorated most cheerfully with evergreen and holly boughs. before entering the house, we cleaned off our muddy boots! 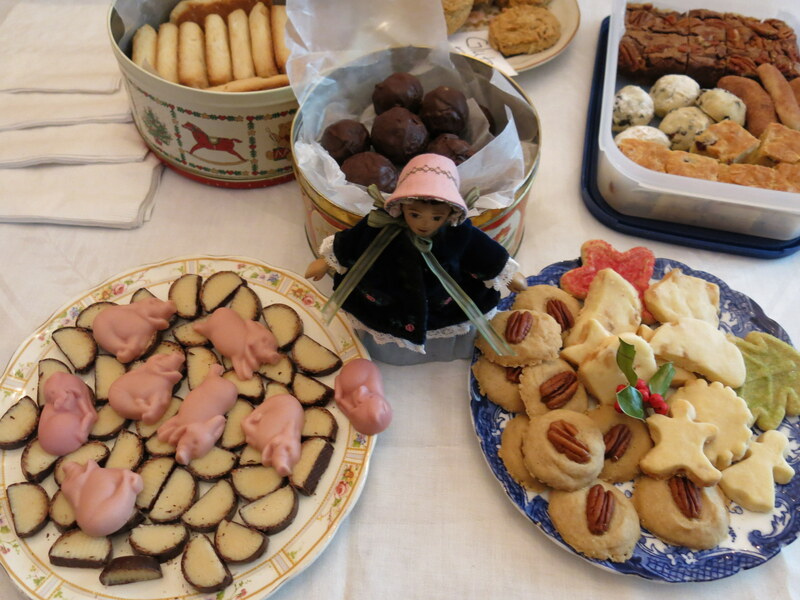 …especially the table laden with tea and cookies! Click here for information about the house, it’s restoration and events. Constance, the tour was endearing. You fit in oh so well…did you taste any treats? We nibbled on shortbread, marzipan and rum balls – yummy! 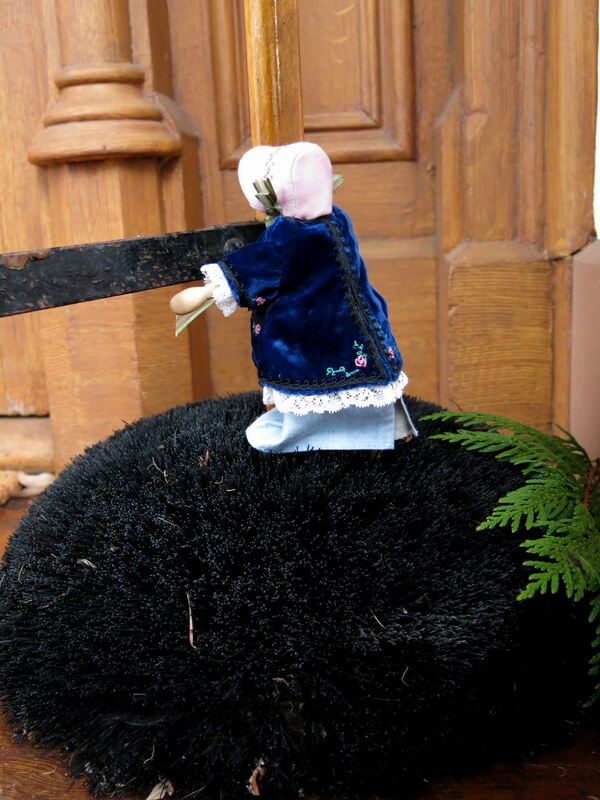 Constance looks charming in her finery, and fits in with the lovely home very well. She would make such a fine docent for the home I would not be surprised if they offered her a job! 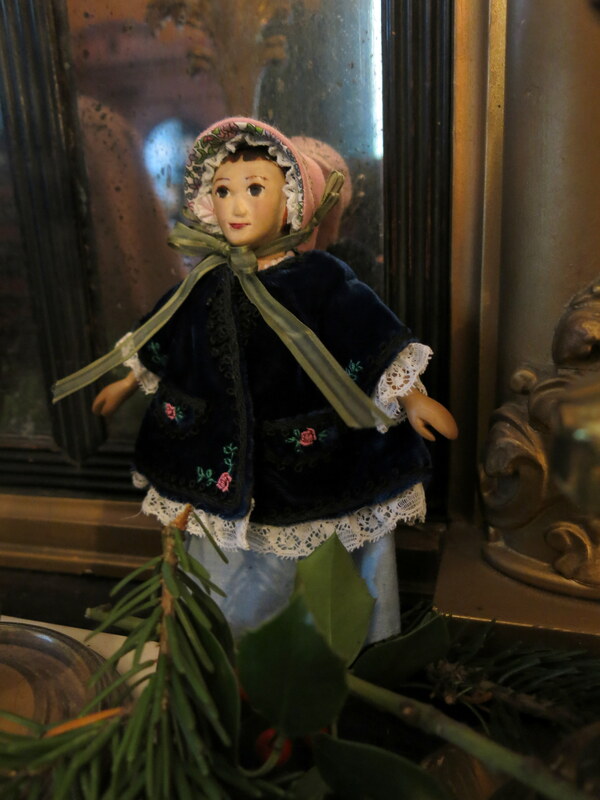 Constance is flattered that you thought she fit in – she is wearing her Paletot and bonnet, and a generic blue 19th century visiting dress! YES! I agree with kathleenivy..Constance looks like she could give tours in this beautiful house. Her beautiful blue coat with pink flowers and her adorable bonnett look apropos for the job. I think she would enjoy that very much, she is thinking of signing up for the next training session! Constance’s coat and bonnet are beautiful, are they new? Those pink pigs are intriquing. The coat is from 2012 check the Tutorials for “A Miss Pinch Pelisse” to see how I made it! The German Marzipan Pigs were delicious! what a fun tour. 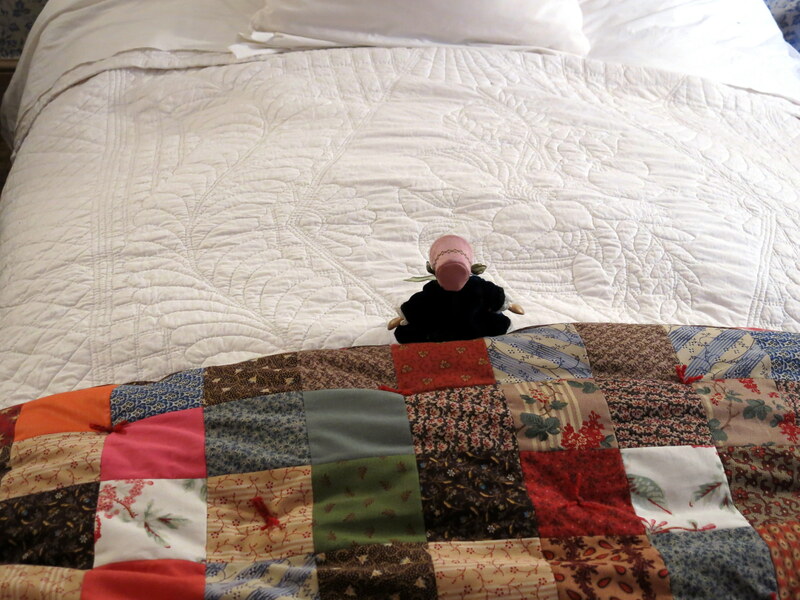 And I agree with the others that Constance looks quite at home here. By the way that pink bonnet is simply magnificent! 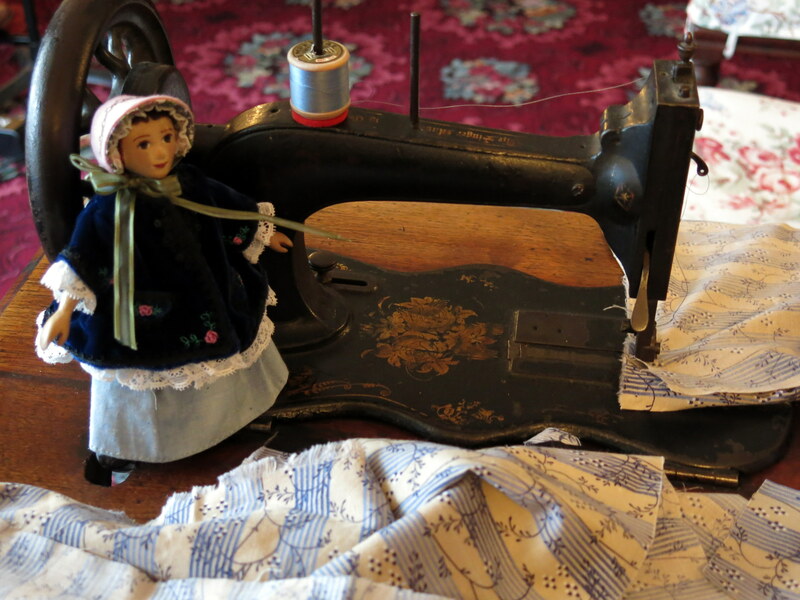 The bonnet was from a Hittygirls Swap back in the day – Constance loves it, and she thinks it goes well with the Miss Pinch Pelisse! Beautiful coat and bonnet. The cookies look yummy. 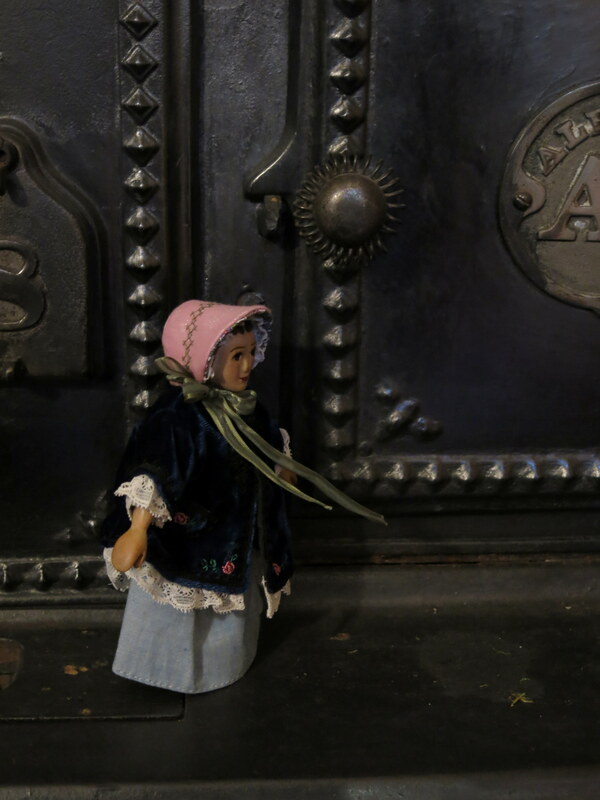 Thanks very much…we made the coat in the Hitty cupboard, but the bonnet was a gift from a Hitty friend! Congratulations – I hope you have as much fun with your girl as I have had with mine!